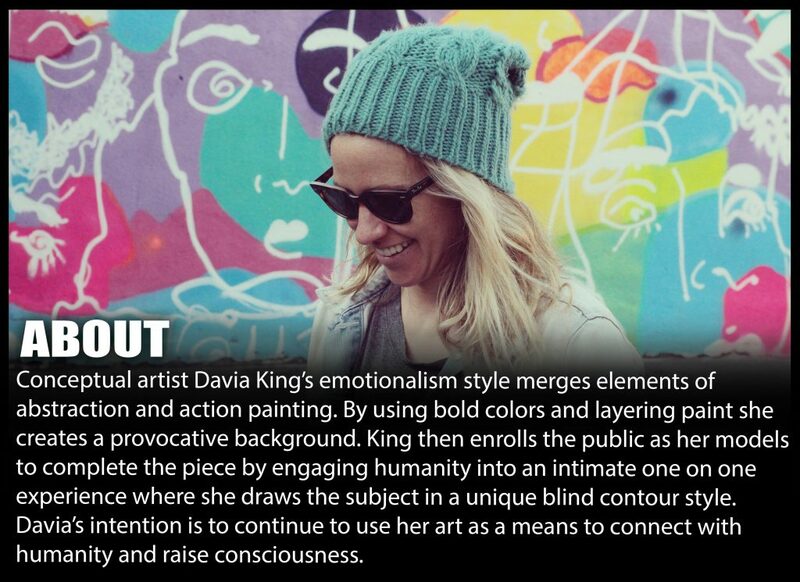 Davia King is an abstract expressionist artist who uses bright colors. By layering thin layers of acrylic ink and aerosol she captures a visual interpretation of creative energy. By allowing the composition to take on a life of its own rather than try to force a preexisting idea, each piece is unique and cannot be replicated twice exactly the same way. King then enrolls the public to act as her models as she captures each person in a blind contour style while creating a moment of connection. Davia has participated in a number of gallery shows throughout southern California. Her murals can be found on city streets from DTLA to Hollywood. 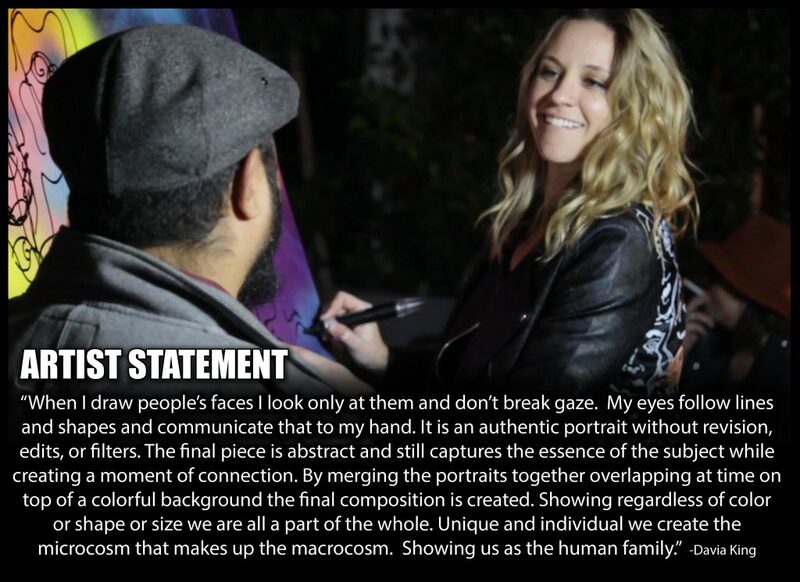 She is regularly live painting and collaborating with the public at different private and public events throughout the Los Angeles area where anyone present can become a part of her next piece. Davia began her art training at the age of 12 taking private lessons. After listening to the sensible rational of the world at 18 she decided to study Business Management so that one day she could be comfortable and rich! She graduated with a B.A. in 2005 from Brigham Young University. After working in corporate America for a year and at the ripe old age of 25 she retired. After some deep introspection she redirected her path to become a life coach and received her M.A in Spiritual Psychology in 2010 from the University of Santa Monica. While taking on clients Davia realized she was helping other people live out their dreams, but still wondered what was her own? So she life coached herself and accepted all she really wants to do is create! Back to the art she flew and in 2011 she began publicly showing her work. After a long hiatus she gathered up enough courage to simply follow her own heart! Davia hopes that by sharing her story others will also have the courage to follow their own dreams. Davia was born on the edge of the Wasatch Mountains in Provo, Utah. Growing up with such great beauty around her was inspiring but the big city energy and culture has always beckoned her and in 2009 she moved to Los Angeles, where she currently resides.